Communities of Practice (CoPs) may be interpreted as kinds of a vertical evolution of social networks, where members share common interests in a particular domain or area, and exchange practical experiences to increase their knowledge and skills with respect to that specific field. In this paper we present some evaluation aspects of an experiment conducted within the framework of the European project UnderstandIT. 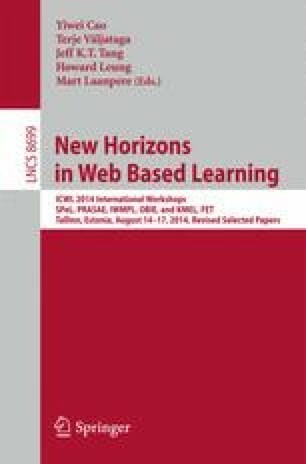 The experiment involved the use of a CoP providing an educational program on Web2.0 Technologies for education for Vocational Education and Training teachers. The CoP was designed on the basis of the foundational Wenger’s concepts of domain, community and practice. In particular, we present a study of some social aspects of the CoP dynamics, basing our study on some evaluation metrics coming from the Social Network Analysis research area, i.e., using metrics such as betweenness, centrality, and closeness, in order to elicit useful relationships information. The experimental results confirm the goodness of the use of such approach for the elicitation of hidden information in the communicative network processes.